Click on the image for a larger view (45 kb). Each image is about 15 cm making a total size of approximately 65 x 65 cm. The work can be mounted as nine separate images direct onto a wall, mounted inside one large frame or five of the images in small identical frames with the four remaining images mounted direct onto the wall. 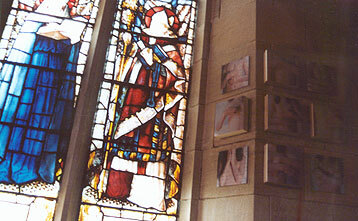 This work was made in response to the Cross Culture exhibition in the Bradford Cathedral (Yorkshire, U.K.), 3 - 26 July 2001. These 9 images explore the cross as a performative act. Gestures are generally acquired unconsciously, and often the sign of the cross is made instinctively by Catholics. These images and the texts on 4 of them raise questions about what happens or could happen physcially and spiritually when you make the sign of the cross. An alternate arrangement using five of the panels. Detail of one of the nine panels. Arrangement in Te Wa Gallery, Whanganui, New Zealand, 2002.